Thanks to the hard work and perseverance of our Legislative Committee, as well as the efforts of many other Maryland art therapists and supporters, particularly those who lobbied their representatives directly and testified in Annapolis, the art therapy profession is now regulated and protected under law in the State of Maryland. Our bill was signed into law on May 29, 2012, and went into effect in October of the same year. Maryland was the 6th state in the United States to pass art therapy licensing and regulations into law. 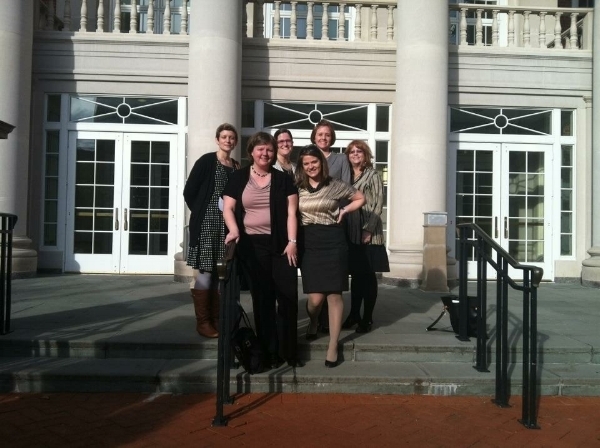 MATA representatives (left to right) Jill Scheibler, Amanda Bechtel, Cathy Goucher, Liz Hlavek, Erin McConnell, and Peggy Kolodny at the Maryland State House following successful passage of Art Therapy Licensure and Title Protection Bill in 2012. In Maryland, art therapists are regulated under the Maryland Board of Professional Counselors and Therapists which, in addition to regulating art therapists, oversees professional counselors, marriage and family therapists and drug and alcohol counselors. Art therapists in Maryland share the same core competency requirements of these other professions and hold the same ability to practice independently and diagnose. The difference is that practice of art therapy is the primary approach for licensed art therapists. The license ensures that the person receiving services has accessed the professional level of care required in state law and regulation. According to the American Art Therapy Association, “The use of art as therapy carries risk of harm if applied beyond the competence of the practitioner” (AATA, 2016). State licensure is key in ensuring that the public is protected from an unregulated practice of mental health treatment, beyond the scope of properly trained clinician. The bill also includes title protection for art therapists in Maryland, meaning that an individual must have a current LGPAT or LCPAT license in order to be called an “art therapist”, or advertise themselves as providing "art therapy" services or treatments. (Health Occupations Title 17. Professional Counselors and Therapists). This bill has routinely been referred to as the “Gold Standard of Art Therapy Licensure”, and is currently the only one of its kind which offers title protection to art therapists in the United States. Furthermore, possession of an LGPAT or LCPAT license also qualifies art therapists for insurance reimbursement from both government and private insurance. This has not only broadened employment opportunities available to art therapists in Maryland, but significantly increased the availability of art therapy in private practice settings.